Isn’t annoying when you need to delete several items in an application, but then get hit with a confirmation dialogue box that requires yet another click? Well, either BetterTouchTool, Keyboard Maestro, and Dragon Dictate can automate the task for you, and save you some clicking. The other morning I was going through my 1Password application and deleting login items that I no longer needed. There were several dozens of them, but I needed to check each item before clicking the Delete button. To delete an item, I had to first click the Delete button and then after the confirmation box opened, I had to click the Return key to send the item to the trash. I get that the confirmation button pops up so users won’t accidentally delete an item. But having to click the Delete confirmation button is an extra hassle. The following are the solutions I use to get around this problem, by automating the task. 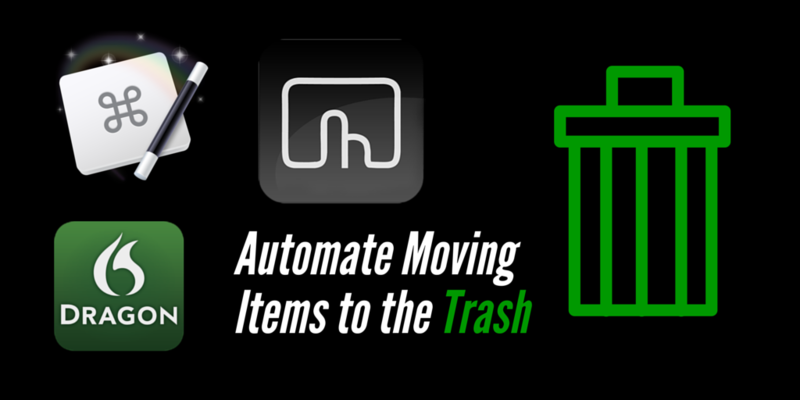 When I get the Move to Trash confirmation, I turn to BetterTouchTool and create a trackpad finger gesture that clicks the Delete and Return keys for me. The gesture action is simple to set up. Instead of creating a universal BTT delete action, I have set up a delete action for specific applications that issue a confirmation button, including 1Password, Activity Monitor, Aperture, and Apple’s Photos app. Here’s how to set it up in BTT. 1. Create a new Touchpad or Magic Mouse action in BTT and assign it a finger gesture. 2. 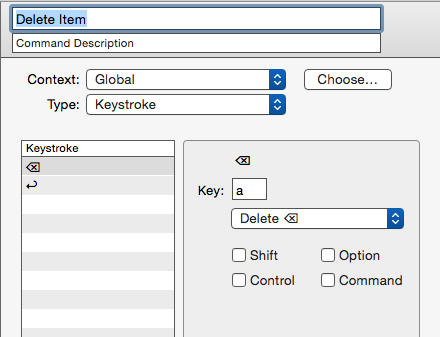 Assign the Delete key to the Custom Keyboard Shortcut (click in the box and then hit the Delete key). 3. Next, click on the Attach Additional Action button and add the Return key to the Custom Keyboard Shortcut box. As noted, BTT will trigger the two actions sequentially. Once this action is set up, all you have to do is use your fingers to activate the keystrokes. When I don’t need to delete a lot of items, but still don’t want to click keys, I use my Dragon Dictate voice command setup. I can select an item, and issue the command, “Delete item”, and Dragon Dictate will click the keys for me. 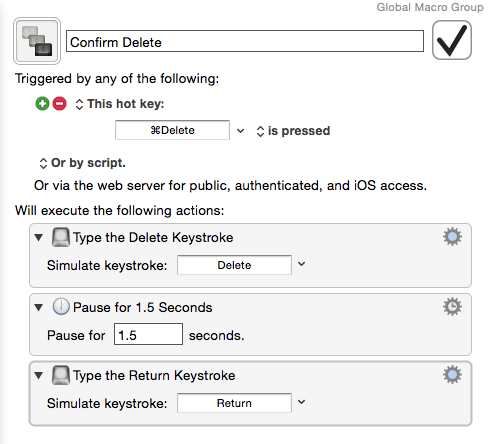 A similar confirm delete macro can be set up in Keyboard Maestro to work globally or in specific applications. It’s these sort of simple, but powerful actions, that can be little time savers during your daily or normal computer workflow. Let me know what you think of these actions, and what similar ones you use in your own automation system. I gotta say, unchecking the box for “Show warning before emptying the Trash” in the Finder preferences is easier and doesn’t require third-party software. Hmmm, that box is unchecked on my Mac, but that doesn’t prevent the confirmation delete in some applications. Unchecking that box is also only for when emptying the Trash. It doesn’t impact other applications. 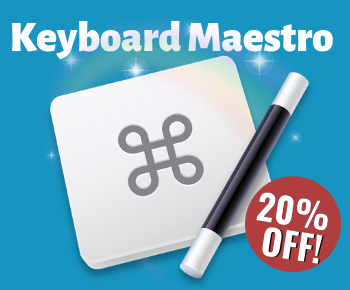 Finally, I would say if you haven’t tried Keyboard Maestro, and you work at your computer on a regular basis, KM is worth giving a try. Excellent list of time savers (and click savers). My FREE guide gives you a list of 50 sample finger gesture actions for your Mac or laptop, using your trackpad or MagicMouse. BTT saves clicking, using hotkeys, and manually performing redundant tasks.